Wow...I saw this had good reviews which led me to purchase this and I feel I've already gotten my money's worth after having it just a few short weeks. I got it at the $299 sale price and delivery was quick by FedEx. I planned to set it up on a Saturday morning and it went quite smoothly, although the directions are pretty much pictures only. It took me alone about 30 minutes to lay the tub out and inflate it. The only part I had some confusion with was where they showed the cover being blown up. I did not realize this cover has an air pillow that is inflated to provide even more insulation to keep the heat in the water. The thickness of this hot tub is commercial grade and very sturdy. The pump was easy to setup and operate. It took about three hours to fill and a good 24 hours to get to 104 degrees. I like it hot and the temp does go down significantly (about 4 degrees per 30 minutes for me) when the bubbles are blowing. The massage action is much better than expected and not having seats is not even an issue for me. I placed my tub inside a popup screen room on a sheet of thermal insulation that you use to put on the walls of the house so, in addition to the padded flooring of this tub, it is quite comfortable. I live in South Texas and the screen keeps the bugs out. Ironically, I have an inground pool with a hot tub feature but having to fire up the heater and the expense involved led me to find another alternative for the colder months and this fit the bill perfectly. My pool guy came to provide the chemical treatments and couldn't believe what he was seeing; he was impressed with the quality and output. You can't beat it for the price. If it lasts one season, I'll be happy. I've read other reviews of persons who have had these 2-3 seasons. I believe it. Very happy, and relaxed, customer. 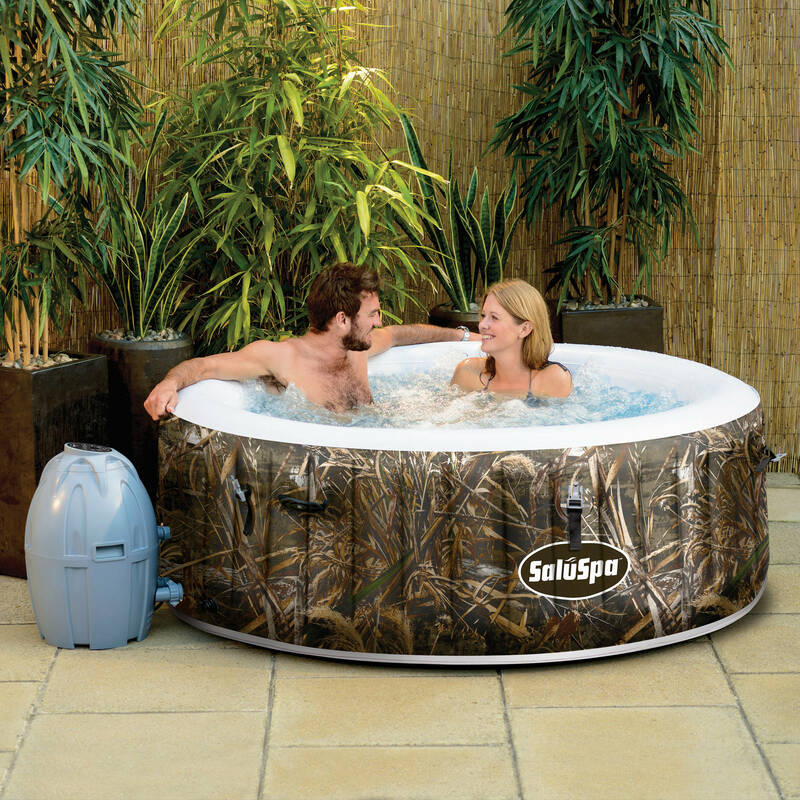 Tbook.com crawls the web to find the best prices and availability on products like SaluSpa Realtree MAX-5 AirJet 4-Person Portable Inflatable Hot Tub Spa. This product is one of the more popular items we list which is why it is in our "hot deals" section. If you have any questions on this product, please give us a call at 734-971-1210 during the hours of 9am - 5pm EST for assistance. Thank you for shopping at Tbook.com, the Internet Department Store!